It’s officially “winter” squash season around here, and that means masses of subtle greens, browns, and oranges are popping up all over grocery stores and farmer’s markets. I’m particularly partial to butternut squash, probably because it reminds me in some ways of sweet potatoes. (Stop laughing; it totally does.) After grabbing one on a recent shopping trip, I started to fantasize about roasting it. And then I started to fantasize about pizza because, really, who doesn’t? Somehow my brain put the two together, and it wasn’t long before I had the mental image of a fully-loaded pizza topped with sweet cubes of roasted butternut squash. 1) Place a vegetable steamer over 1″ of water in a large saucepan. Add the kale, cover, and steam until bright green and tender, 2-3 minutes. Remove from heat and set aside. 2) Preheat the oven to 425°F. On a rimmed baking sheet, combine the butternut squash and 1 tbsp. of the oil. Stir until all the cubes are coated in oil. You can dust the cubes with garlic powder for more flavor if you wish. 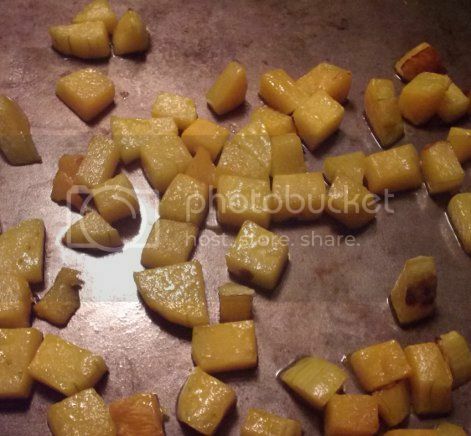 Roast the cubes until tender and just beginning to brown, about 20 minutes, stirring occasionally. 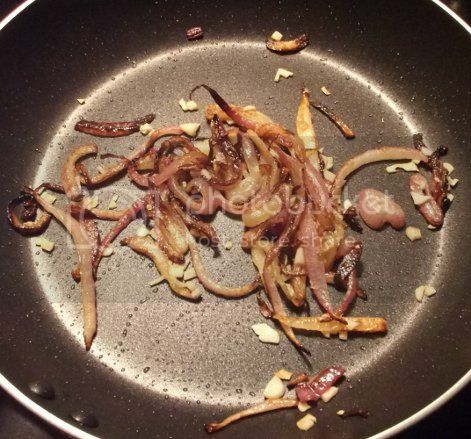 3) Caramelize the onions. Place 1/2 tbsp. oil in a small skillet over medium-high heat. Add the onions and cook, stirring frequently, until browned and sweet-smelling. This can take 15-20 minutes. Be careful not to burn the onions; you want them sweet and brown. Just before the onions are done, add the garlic and cook until fragrant, about 1 minute. Remove from heat and set aside. 4) About 8 minutes before the squash is done, spread out the dough into a lightly-oiled pizza pan. Place the dough in the oven and remove when the squash is finished. 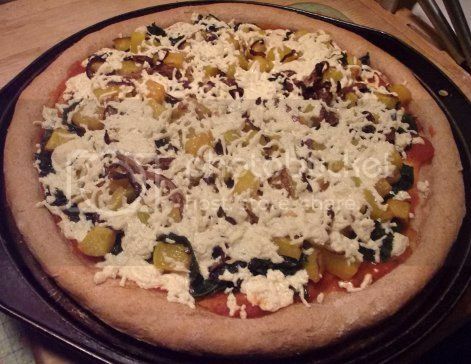 5) Spread sauce over the dough in the desired quantity. 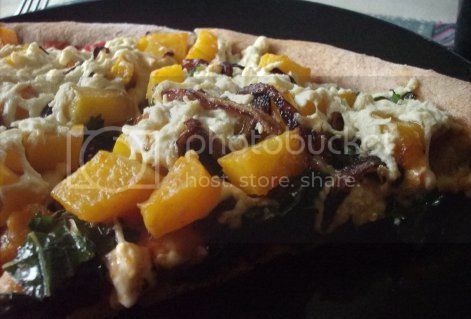 Top with the kale, squash cubes, caramelized onions and garlic, and Daiya. Return to the oven and bake until the crust is lightly browned and the Daiya is melted, 10-12 minutes. This pizza looks good! I’d probably go with sweet potato instead of the pumpkin but other than that, yum! I’ve swapped sweet potato and butternut in recipes before and it tastes pretty good! 🙂 Let me know if you try it…I love sweet potatoes.